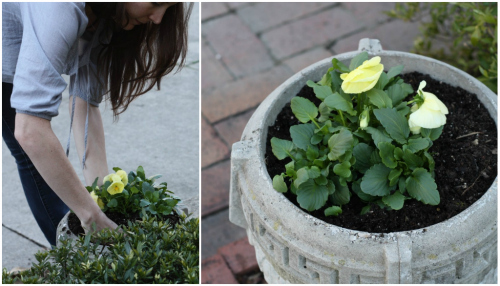 Remember the beautiful yellow pansies we planted in our front urn planters back in March? 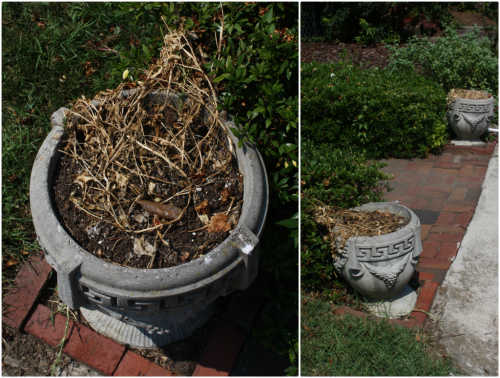 Luckily, we had plans to keep these urn planters fresh with seasonal plants, so we decided it was time to switch things up! 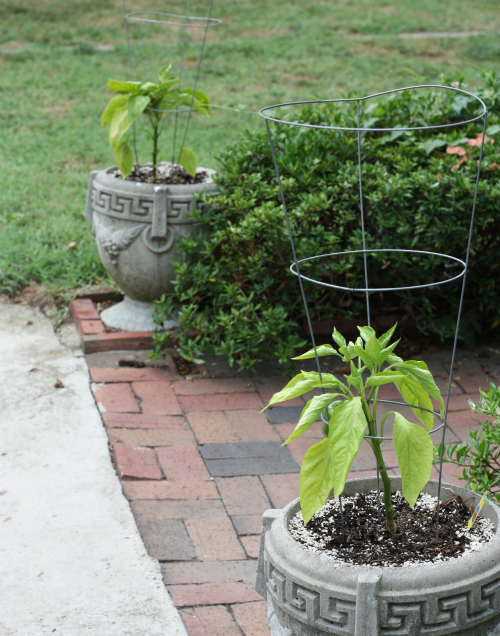 On a whim, we decided to try our hand at a little edible landscaping with the planters this go round and transplanted a yellow and red pepper plant into them, then fitted them with two plant cages that we brought over from last year's garden during the move. We are so curious to see how they will do. If they do well, we should have yellow and red peppers coming to some 17 Apart recipes soon. Crossing our fingers and continuing to water! 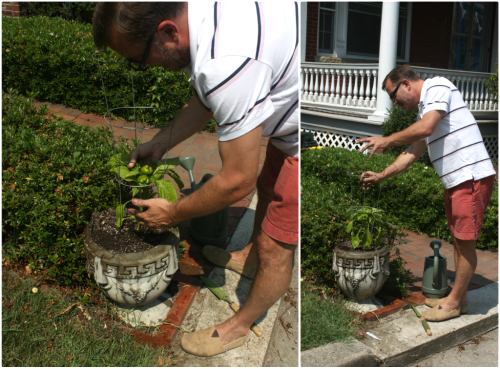 So if you're passing by — yeah, that's us — the ones with the big pepper plant planters out front! 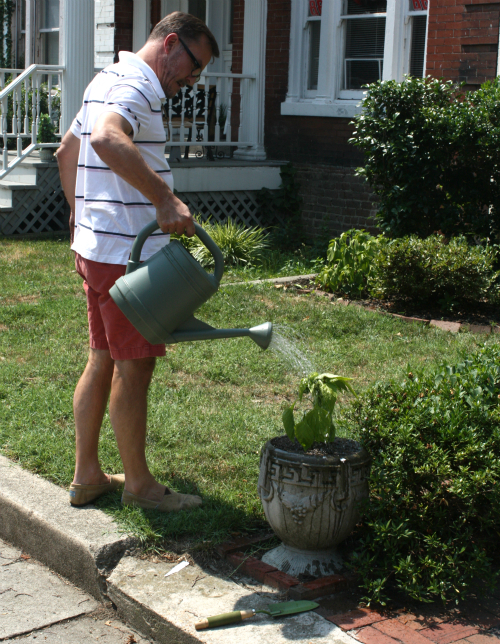 Have you delved into any form of edible landscaping or planted vegetable plants out front? 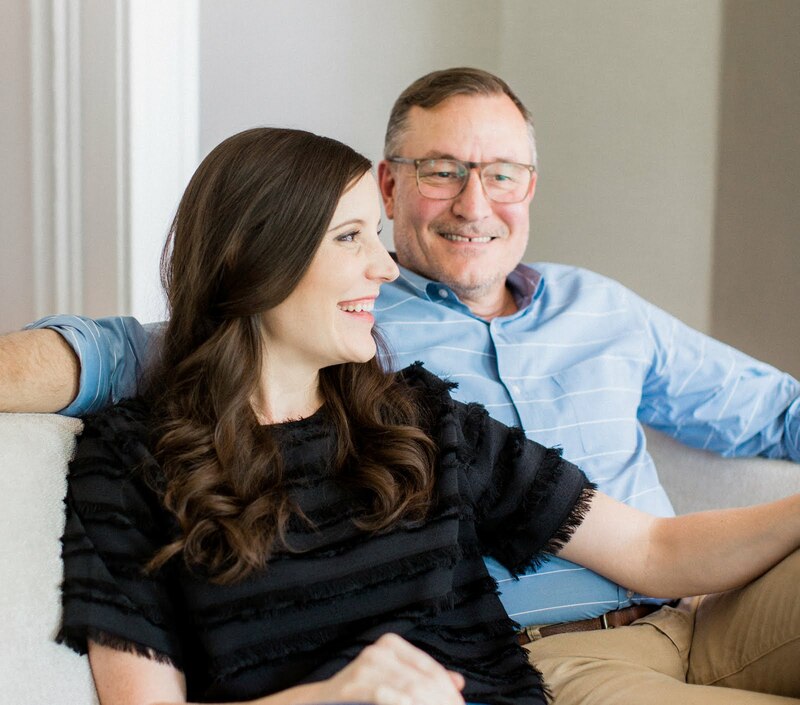 This is our first go round (other than our herb box) so we'd love to learn from your experience. Oooh those look good! Fingers crossed the heat doesn't do them in. Thanks Angie - so far so good! Fingers crossed here too. Yes! Most of the plants in my front yard are edible, minus the grass (I'm not that open-minded!). This is our first year owning a home, and I really wanted to double-up on the aesthetics and practicality of the landscaping. We planted some blueberry bushes and tomato plants in the yard, and all of the pots on my front porch are edible - carrots, basil, onions, parsley, green beans, and peppers! Love it Ashley! Absolutely jealous of your blueberry plants — we'd love to try berry bushes at some point. Do you find any issues with birds getting at them? For the first few weeks, we were regularly picking the blueberries as they ripened, and had no problem. I remember going out to water the bushes one evening, and thought how the berries would be ready for picking in the morning. The next morning I went out, and they were all. gone. So yes! Birds, or maybe the chipmunk that lives under my steps got to them. I'll have to be more proactive and put chicken wire around them next year. Yes Ashley they can be pesky this time of year. We are ok with sharing but taking them all? No! 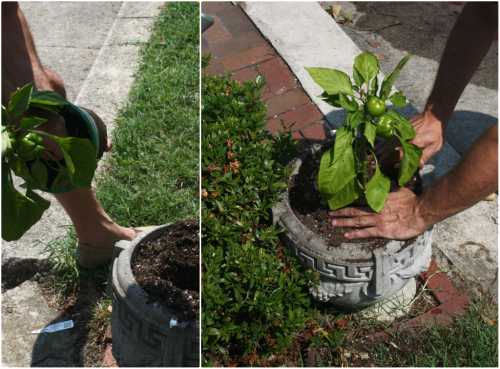 Peppers are hard to kill! Yay for you! We had a front yard garden in California too, but now we're in Iowa and we are in an apartment, so I'm working on seeing how I can deck out my balcony with delicious greenery and edibles! Sounds like us! We are trying our best to get creative in a small space while making the most of the different sunny patches we have. It depends on where you live. 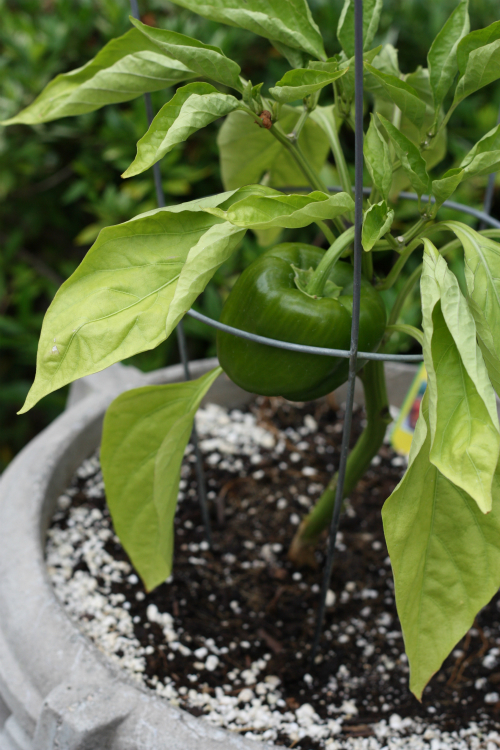 Peppers can be very difficult to grow in some places with fickle weather and excessive dry heat over a short growing season (i.e. my home state). 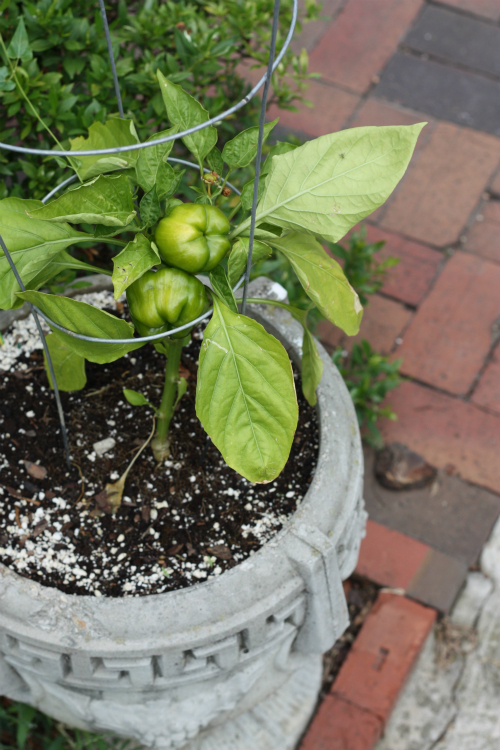 I've tried many times to keep them happy, but my best "success" was a total of three pathetic peppers in one season from plants that didn't die. Those peppers are cute! Seems like you're gonna reap beautiful fruits again. Maybe it will look better if there's a lot of it in a rock garden. 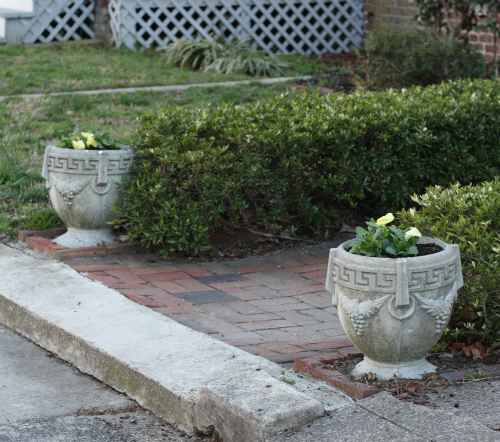 And if you can do it by yourself without hiring people to do it, arrange bigger landscapes or improve your pavement at home. And also, don't forget to post pictures!